The Coffee Cup Revolution. Photo: Binners project. Every week, in Vancouver, Canada, 2.6 million coffee cups are sent to landfills instead of being recycled properly. 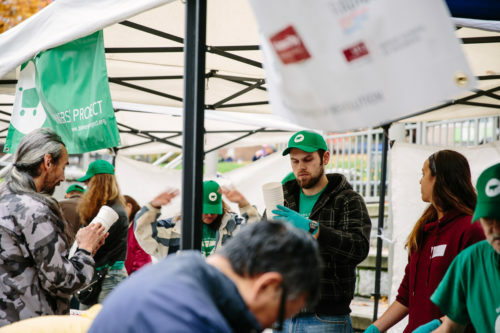 Through the Coffee Cup Revolution, binners have fostered a larger discussion on how we can address this problem in a way that recognizes the important role binners are playing keeping the city clean and managing waste streams. While the depot was open, binners also hosted roundtable conversations to discuss: reducing single-use items, developing the informal economy, and increasing social hiring. At the end of the day, 53,783 coffee cups were collected, breaking last year’s record of 49,060. The depot was exclusively run by and for binners. The income opportunity for binners amounted to $2,689.15 in one day. Binners’ Project is a group of waste-pickers aided by support staff dedicated to improving their economic opportunities, and reducing the stigma they face as informal recyclable collectors.